Hosh came and sat beside his father when the other two had left the room. He took his weak hands in his own, and willed his comforting warmth and understanding to flow through. "The first candle was Peace." "It diminished slowly and went out completely." "The second candle was Faith." "Unneeded, unheeded, its flame slowly weakened too. It coughed finally and died." "The third candle was Love." "Suffocated by emotion, it sputtered out completely." 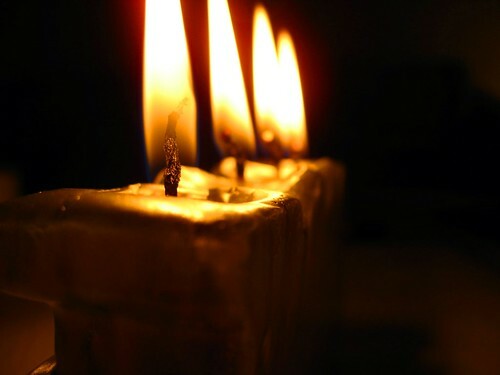 "A child entered the room and saw that three out of four candles were no longer burning. Shadows that were creeping up on the walls, leapt at him now." "Suddenly afraid of the growing darkness, the kid began to cry." "Why are you not burning?” he implored the dead candles. “You were supposed to guide me until the end." "The flame of the fourth candle flickered up as it heard this." “Do not be afraid,” it said gently. “For I am Hope, and while I still burn, we can rekindle the others." “Through tear-filled eyes, the kid peered at the last burning candle. Scared to put it out when he moved it, he stood rooted at his spot." “Come here child,” Hope beckoned again compassionately. "Be strong. Look, I'm still alive and well." "Gingerly, the child picked it up and re-lit the other candles. Life brightened up again, dispelling darkness from the furthest corners of the room." "Joy returned to his heart, and he was strong and content once again." A solitary tear broke out of the corner of his father's eye. "Keep Hope alive," he nudged him gently. "So long as there is Hope, all of us can live again with Peace, Faith and Love. Recover from the darkness, recoup our lives." He hugged his son, and lay back. He felt tired. Very tired. "Go now," he said, "and rest. You've had a long day. You must be tired." Hosh kissed his father's hand, got up and walked quietly out of his room.